19. Scafati, Villa rustica detta di Domitius Auctus, Fondo Acanfora, contrada Spinelli. Villa rustica called Gnaeus Domitius Auctus found in the fondo of Matteo Acanfora in contrada Spinelli, Scafati (today Pompei), excavated by Vincenzo De Prisco in 1899. The name derives from a rectangular bronze signet seal found on the property. Carrington, R., 1931. Studies in the Campanian Villae Rusticae: Journal of Roman Studies, 21, pp. 111 (n. 19). 112 and note 8, 113 and note 1. Casale A., Bianco A., Primo contributo alla topografia del suburbio pompeiano: Supplemento al n. 15 di ANTIQUA ottobre-dicembre 1979, 69, p. 42, fig. 19. Day, J., 1932. Agriculture in the life of Pompeii: Yale Classical Studies, 3, p. 186, tav. B, C, n.19. Della Corte, M., 1965. Case ed Abitanti di Pompei. Napoli: Fausto Fiorentino, p. 447. Notizie degli Scavi di Antichità, 1899, pp. 392ff. Rostovzev, M., 1973. Storia economica e sociale dell'Impero romano, Firenze, 5° ediz., p. 34, note 26, n. 19. Van der Poel, H. B., 1981. Corpus Topographicum Pompeianum, Part V. Austin: University of Texas, n.19, p. 22, and plan. Scafati, Villa rustica detta di Domitius Auctus. Plan of villa after 1899 excavations. In Scafati were found the remains of ancient villa of l’ ager pompeianus (rural surroundings of the city). In the fondo of Matteo Acanfora in contrada Spinelli, Vincenzo de Prisco made this excavation from early March to mid-May of this year, an excavation that brought briefly to light the areas seen on the plan, which is offered here. The existence of an ancient villa of well-known type was established in this place, or the part of it today explored, without doubt the part used for rustic business. See Notizie degli Scavi di Antichità, 1899, p. 392, fig. 1. See Casale A., Bianco A., Primo contributo alla topografia del suburbio pompeiano: Supplemento al n. 15 di ANTIQUA ottobre-dicembre 1979, 69, p. 42, fig. 19. The areas so far discovered were gathered around the peristyle "A", which was surrounded on the west side and part of the north side by portico "B"
This was supported by pillars and a single column of masonry covered with brick plaster. The pillars were brick, tufa and limestone, with a coating of cocciopesto. Around turned the rainwater channel with coating also of brick and sloping towards the cistern “a”. Bronze: two bridles and various ornaments for horses. Bronze: two small scales, a large bucket and vase with two handles in the shape of the shell. Travertine: two weights with iron handles. Iron: a lock and other indescribable fragments. Terracotta: an entire amphora and several others broken, two pots, a sieve or strainer and fragments of a cup. In the north-east corner of the peristyle was a portion of the cella vinaria with six large earthenware dolia (jars) in situ. Before we move on to the description of individual rooms, generally their construction was of Opus incertum, strengthened by brick jambs alternated with rows of tufa, or jambs of limestone and tufa. Except for two rooms, "D" and "H", which had decorated walls, all the others were rustic, all with the a zoccolo of cocciopesto. The entrance doorway was under the northern ala of portico "B". It had decoration on a yellow background partitioned by white pillars, ornamented by candelabras with foliage. In this room the most notable find of this excavation was made. Gold: a leaflet (of Laurel) and a pair of earrings in the form of spheres a bit squashed, with six inset blue-coloured stones, possibly of blue glass-paste, but not to say that these earrings were by any means devoid of artistic merit. Scafati, Villa rustica detta di Domitius Auctus. 18th March 1899. Room “D”. A silver statuette of Isis-Fortuna, 0.13m tall with the small hexagonal pedestal also of silver. On her head, she has a modius (cylindrical headdress), a crescent moon and a lotus flower. With the right hand, she held up a rudder and on the left wrist was a bucket and some corn. It was finely worked and was important for the fusion of elements, more accentuated than what is seen in the figure of Isis-Fortuna in Pompeian paintings. See Notizie degli Scavi di Antichità, 1899, p. 393, fig. 2. A silver statue of Venus Anadyomene, 0.95 tall with the base. She was crowned with a diadem, standing naked, and nearby was a dove. It was very well shaped, and the dove was portrayed with ease and precision. See Notizie degli Scavi di Antichità, 1899, p. 393, fig. 3. 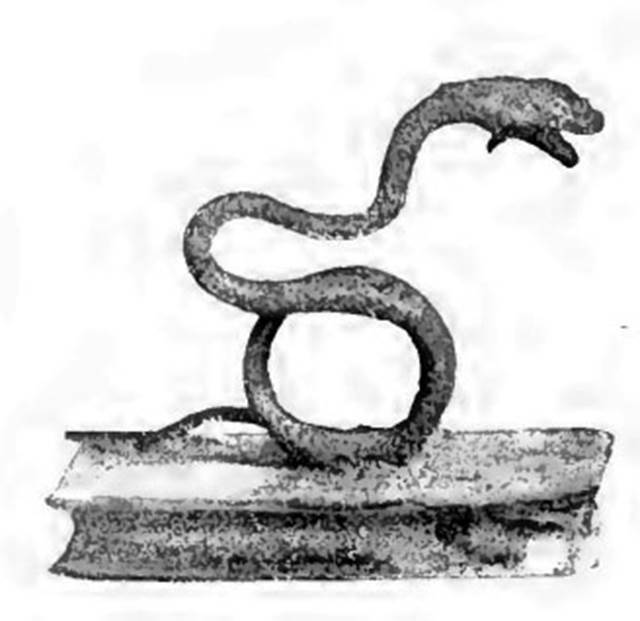 A silver serpent raising itself on its coils, with base. See Notizie degli Scavi di Antichità, 1899, p. 394, fig. 4. The preservation of these three items was surprising, taking account the material, which was silver, usually to be found oxidized, greatest in the locality of discovery, where the earth does not exceed 6 metres in height. No doubt they formed the collection from a lararium. 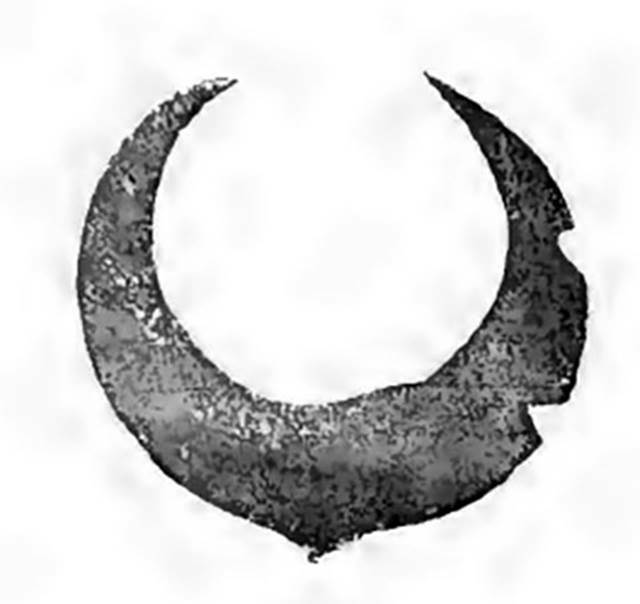 Fig.5: Also found was a silver half-moon, accentuated by that which was seen in the figure of Isis-Fortuna of Pompeian paintings, but not well-preserved. See Notizie degli Scavi di Antichità, 1899, p. 394, fig. 5. According to Carrington, his cognomen indicates that Cn. Domitius Auctus, if not himself a libertus, was probably the son of one. Not many Domitii have been found in Pompeii, and in the only other cases (two in number) in which the praenomen is preserved, it is Lucius. The gens may, however, have been represented by two families, the Lucii and the Gnaei Domitii, or, as at Rome, the praenomina, Lucius and Gnaeus, may have alternated in succeeding generations of the same family. One member, at any rate, of a Pompeian branch of the gens can be connected with the wine trade, though the precise form which the connection took is doubtful. This is a woman, named Domitia Modesta, whose name occurs on an amphora. C.I.L. IV, 5818. See Carrington, R., 1931. Studies in the Campanian Villae Rusticae: Journal of Roman Studies, 21, p. 112-3. See Duff, A. M., 1928, Freedmen in the Early Roman Empire, Oxford: O.U.P., p. 110. 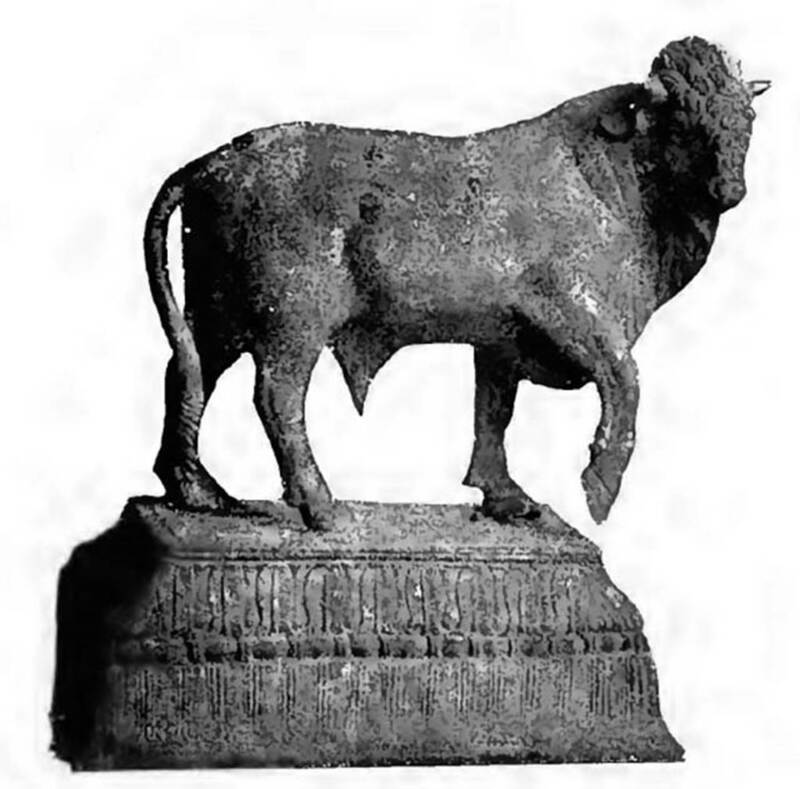 A small bronze bull, wonderfully conserved, resting on a rectangular base worked with engraving. It was 0.17m high, from the floor of the base to the top of the head. See Notizie degli Scavi di Antichità, 1899, p. 395, fig. 6. See Notizie degli Scavi di Antichità, 1899, p. 396, fig. 7. A small head of a ram, a plate, a handle of a simply-made pot, two other handles with masks, several fragments of locks and hinges, three hair-pins and a tweezers. In glass: Several perfume bottles and small pots. In terracotta: Three small amphorae and other small objects. In bronze: Two clasps, two pendants and tweezers. In glass-paste: Thirty-two spherical beads for a necklace. In bronze: A small funnel. In iron: Two short two-edged swords, of which the one had the grip covered with ivory. In terracotta: A large lamp and a small handled pot. Scafati, Villa rustica detta di Domitius Auctus. 22nd March 1899. Room “D”. 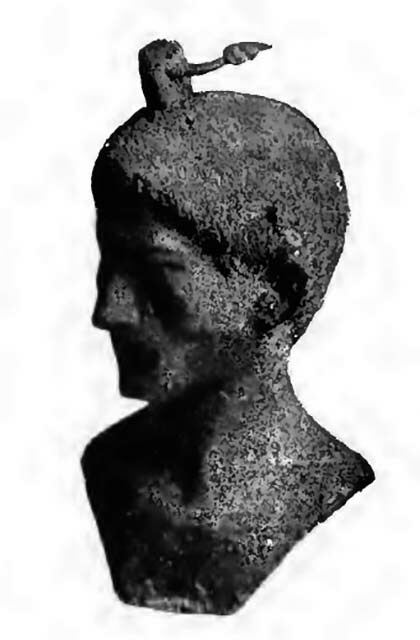 Bronze virile bust, 0.09m tall, well preserved and well-modelled used by the Romans as a steel-yard. See Notizie degli Scavi di Antichità, 1899, p. 397, fig. 8. In bronze: A colander; a large lamp; a bucket and a jar. In marble: A mortar with its pestle. In iron: three hoes, two rakes, two gaffs, two broken saws and two hooks. Under the north portico was the fauces/corridor “F”, in which were the doorways to rooms “G” and “H”, both cubicula. In bronze: A basin with two handles, a jar with a handle, another spherical jar and three corroded coins. In iron: Two points of spears, a short two-edged sword, a bricklayer’s stake, a trowel, a hammer, three chisels of varying shapes, a carpenter’s axe, a hoe and other utensils in fragments. In glass-paste: A small phallus. In lead: Two supposed weights. In the first line is certainly to be read TAVR(omenitanum). See Notizie degli Scavi di Antichità, 1899, p.396. The cubiculum was decorated with yellow and purple panels. The remaining rustic areas "I, L, M and N" showed nothing of interest. In bronze: A two-handled basin and a boiler. In terracotta: A fragmented plate and two jugs. In bronze: A poorly preserved boiler. In lava: A small mill. Organic material: A dog’s skull. Around portico “B” ran the rainwater channel with covering of brick and sloping towards the cistern “a”. In a corner, bounded by the east wall of the room "M", and the north wall of room "N", the oven 'b' and the hearth ‘c’ were located. In iron: The closure door of the oven and a shovel for putting bread into the oven. Rustic room which did not have anything of interest. A little distance from the oven, the latrine was situated, near which several amphorae were found against the wall, including eight with inscriptions. See Notizie degli Scavi di Antichità, 1899, p. 397-8. In this room, it seemed one could recognise a threshing floor.